Life isn't all just going from one Chinese grocery to the next. Some variety has come gradually into our lives and it's done in some different ways too. This is sort of the Belize version of online grocery shopping. Like what sorts of things? You might ask. Well, like cheeses, and snack stuff, exotic breads, meats, canned goods, Health Foods, and such. Just a lot of items that either isn't available in the local stores or might make an appearance there sporadically. Santiago Castillo, started in 1926, is the largest food wholesaler in the country. They have a distribution center in Orange Walk as well as several other locations around the country. Santiago Castillo has a small truck that comes to Corozal more or less every other week. They usually stop at someone's house (an advance email or Facebook Message let's most folks know where and when they'll be located. I suspect these visits provide more than just a convenience for customers for hard-to-find items. 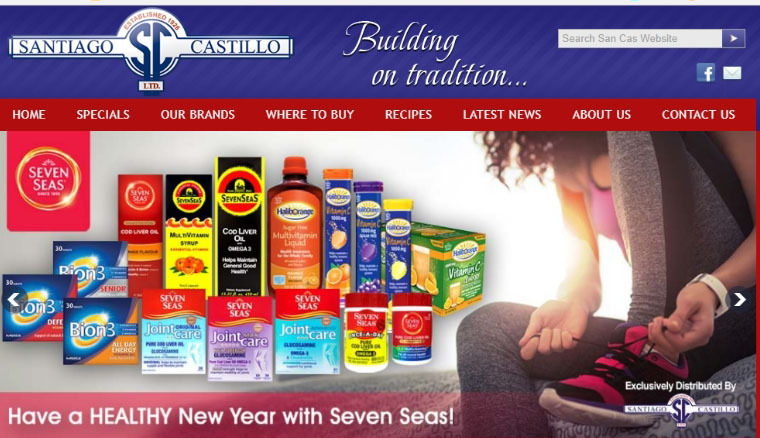 It's also a way for Santiago Castillo to let the public know about new products that may not yet have made their way to the local stores. They even have their own private label foods line, marketed under the Tastee label. Another company is Ian Anderson's Caves Branch Adventure Company and Jungle Lodge. It's a multi-faceted company with adventure touring as a mainstay. They have a resort as well. And, something a bit odd-seeming, they make some wonderful world-class cheeses. Not only cheeses but they have some great smoked meats, breads, and spices. I've included their catalog as well. 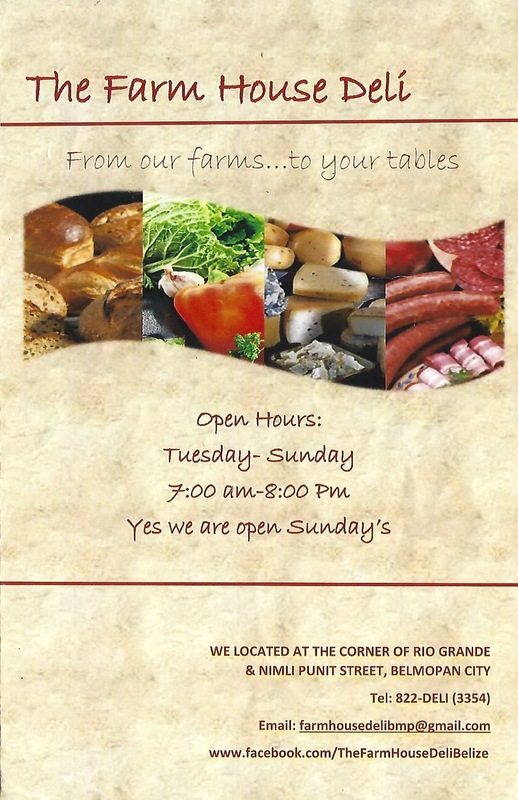 For a while, Caves Branch was making a bi-weekly stop here in Corozal to sell a selection of their catalog. That was very convenient, but I suspect the market here wasn't yet large enough to sustain that effort over the long haul. But, you can order everything they have. It's packaged up and delivered by Tropic Air to your nearest airstrip. Here's our package that came from Tropic. Colleen took care of the group-ordering for us. She messaged me yesterday evening that our orders had all come in. For some reason, Ian Anderson, the owner, was enroute to a meeting in Chetumal, and he brought the order with him to Corozal. Denis and I went over to Colleen and Bruce's this morning and picked up the goods. Dianna and I had ordered a wheel of Trappist cheese, which is a tasty, firm cheese and goes great on sandwiches. We also ordered a wheel of Parmesan cheese. The perfect topper for all sorts of dishes, and really puts canned parmesan to shame. To give you an idea of the size of the wheels I included my hand for scale. Using a cheese grater, this wheel will last us at least three to four months. I old wheel is speedily becoming a sliver, so it was definitely time to order. Our Trappist wheel is a firm cheese that goes great on sandwiches, and would probably make good grilled cheese sandwiches too. Haven't tried it though. 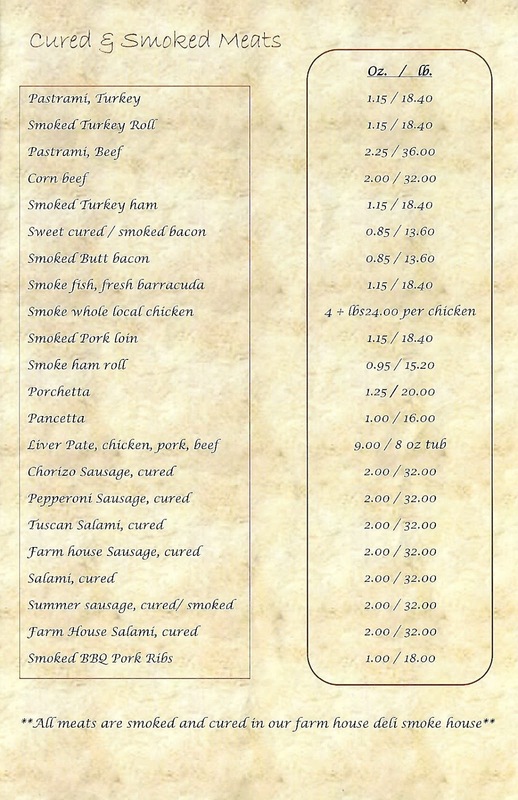 This is the Caves Branch catalog of all the foodstuff they offer. It's all good, to turn a phrase from a Canadian grocery chain. This is quite a different offering for a company that is ostensibly a hotelier and an outdoor adventure enterprise. 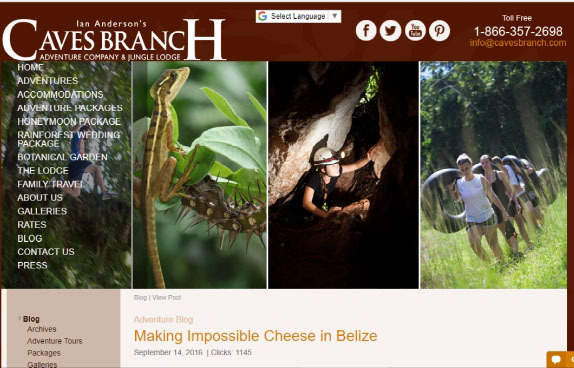 You can read on their website (https://www.cavesbranch.com/belize-adventure-travel-blog/post/articleid/208/making-impossible-cheese-in-belize) all about how the owner, Ian Anderson, got interested in cheese and cheese making. If you've a mind to, you can also learn to make cheese while enjoying a jungle vacation. 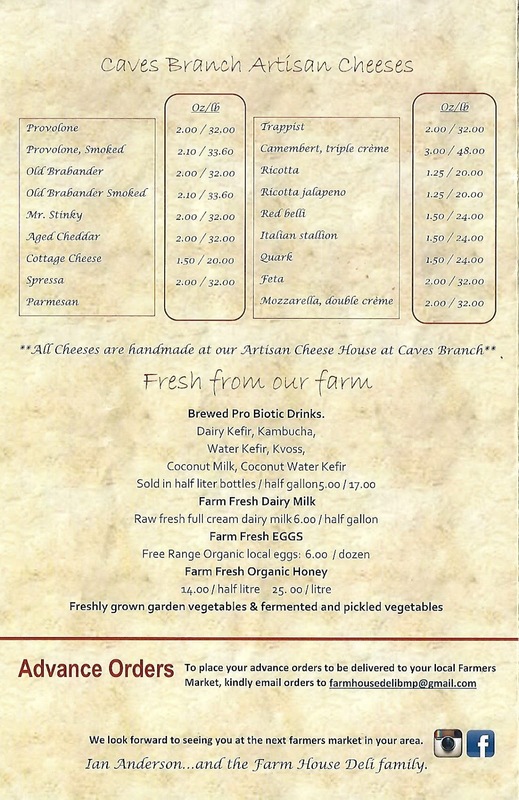 Caves Branch has a formidable list of cheeses that are available, especially for a part of the world that is not generally known to produce good cheeses. and then the newest find for us is this place, Shoots Alive. Elizabeth turned us on to this a few days ago. Shoots Alive (https://www.facebook.com/Shoots-Alive-733442000116898/) is located on the Western Highway in Georgeville, Cayo, Belize, near San Ignacio. I have to confess that I screwed up right away visiting Shoots Alive on Facebook. They have a new customer page (https://shoots-alive.myshopify.com/pages/new-customer), on their Shopify website (https://shoots-alive.myshopify.com/) which I all but ignored. I didn't read the pertinent information regarding minimum orders. The New Customer page has all Shoots Alive's ordering, shipping, and payment details. Don't do as I did and space right through all that. I wondered why Elizabeth said something about that she had ordered with a couple other people. I could have saved a bit of money if I had just paid attention. I'm aware now. 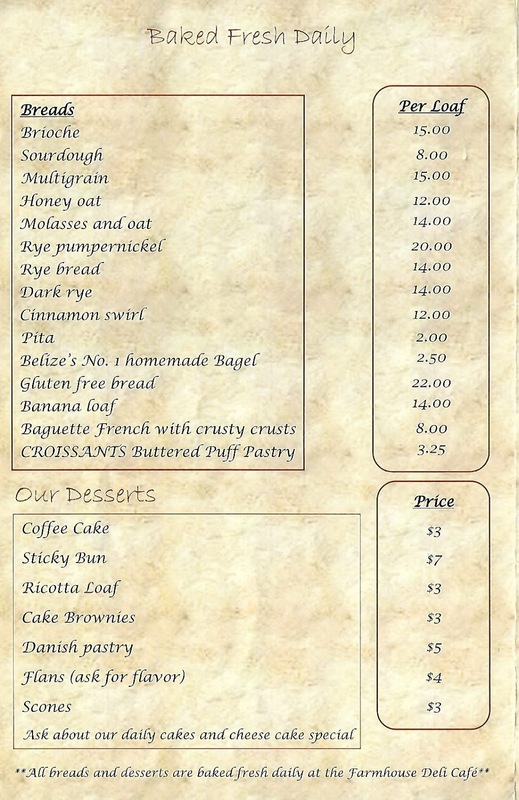 I'm looking forward to this Wednesday when my first order arrives in spite of myself at the Corozal Airstrip. In the meantime, I'll content myself with munching on some exotic (for Belize) cheeses. and my pickles from Santiago Castillo. 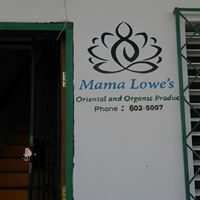 With all these places, I can't forget a new local Corozal grocery - Mama Lowe's Oriental and Organic Produce (https://www.facebook.com/Mama-Lowes-2199860093572731/). She sells a lot of other stuff as well. They're located right at the south-east corner of Central Park in Corozal, 55 1st Street South & 4th Avenue, in case you're into specifics for an address. Mama Lowe has so much goodness of an oriental nature. There's a ton of stuff that I have no idea how it would be prepared or even what it would be used in. I love just strolling through the store. Now, I guess the clincher is that, recently, Dianna and I decided that weight (especially for me, was out of control). Thanks to Catherine of Catherine and Charles for turning us on to the Ketogenic diet. Years ago, we had been on the Atkin's Diet and lost weight. Of course, we didn't keep up with it at the time. It might have been around the time we were nearing moving down here to Belize, I don't remember exactly what was going on. Anyway, we fell off the diet wagon and moved here. Now, we're working to get a bit slimmer. I'll write more about this as time goes on. For now, I've lost eleven pounds and counting, so I'm happy. But, the dichotomy here is, that with the keto diet, there's a lot of stuff at these businesses, and virtually every other one in Corozal, that we can't eat. But, there's is stuff at each of them that we can. Like I said, more later on the diet. For now, I think I'll have a handful of nuts and some cheese.